Our 2017 DeMarini Vendetta Fatpitch Review comes after a few hours’ research and cage experience with the bat. It should be considered a starter bat for travel ball players. Expect a real butter smash even on mishits, insomuch that bad hits actually feel good. Newer players seeing big time pitch speed will appreciate that. It also swings heavier than its top shelf peer, the DeMarini CF9. The drop 12 Vendetta is great choice in the drop 12 space—one of the very best in our opinion. The drop 10 is great as a backup or batting practice bat for elite players, or as a starter bat for those new to the craft. Our 2017 DeMarini Vendetta Fatpitch Review comes after a few hours' research and cage experience with the bat. It should be considered a starter bat for travel ball players. Expect a real butter smash even on mishits, insomuch that bad hits actually feel good. Newer players seeing big time pitch speed will appreciate that. It also swings heavier than its top shelf peer, the DeMarini CF9. The drop 12 Vendetta is great choice in the drop 12 space---one of the very best in our opinion. The drop 10 is great as a backup or batting practice bat for elite players, or as a starter bat for those new to the craft. There are at least a few player groups that will appreciate the 2017 DeMarini Vendetta. The largest group may be the younger players looking for their first row in competitive fastpitch. Indeed, the bat has all the features of a serious bat—namely, two piece composite construction with a large barrel. The Vendetta’s use of a softer composite makes the transition into faster pitches and unruly bat speeds more manageable. Yet the soft barrel and flexible transition is exactly why more experienced players may do well with another model, like DeMarini’s CF9. A stiffer feel and a more firm barrel generally hits the ball more powerfully. Hence the reason the Vendetta is not for everyone. The 2017 DeMarini Vendetta comes in both a drop 12 and a drop 10. The drop 12, in a two piece composite, is one a very few on the market. It serves the new and weaker hitter well. The drop 10 is a little more serious and should be considered more of an end load than a balanced bat. Like the top shelf CF9 from DeMarini, the Vendetta is also a two piece composite bat. However, expect a transition without added technology, a composite barrel with a few year old technology (C6) and a less stiff feel. Compared to the 2016 DeMarini Vendetta, you can expect no changes but the color up. In fact, the Vendetta has not changed much for several years and has become a staple entry level bat in the fastpitch space. In the Drop 12 two-piece composite space the DeMarini Vendetta has at least a little bit of company. Maybe the most popular, Easton’s FS3 fastpitch (our 2016 FS3 review) bat is a lighter swing than the Vendetta, but it has the same feel of an entry level travel ball type bat. Slugger also makes a fastpitch bat in the drop 12 space called the X12. Like the FS3, it is a light swinging bat. Expect the drop 12 Vendetta to swing slightly heavier than either the FS3 or the X12. If we are to believe the average of most online reviews, then the FS3 is the most popular and the Slugger X12 should never be bought. If you need a slightly heavier option in the drop 12 space, then the Vendetta is a great choice. Otherwise, we think the Easton FS3 is a winner. In the drop 10 space, the options in fastpitch softball bats appear endless. There is not a bat that does not come in a drop 10. As such, the range of performance standard varies greatly. 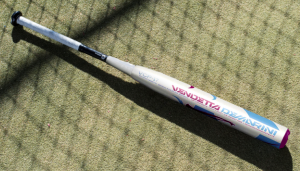 The Vendetta serves as an entry level bat with a real soft smash and a slight end load. If that describes your hitting needs, then it may very well be the bat you have been looking for. Otherwise, Slugger’s LXT or XENO, Demarini’s CF9, Easton’s MAKO, Marucci’s Pure or Rawlings’ Quatro—to name a few—might be the better option. We referenced a number of articles in putting together this 2017 DeMarini Vendetta Review. Many we think you might also find helpful in your quest to learn about the 2017 DeMarini Vendetta. Of course, DeMarini’s Vendetta product page is a good place to start. Justbats.com Vendetta product page as well as closeoutbats.com section on the DeMarini Vendetta. Amazon’s Product page has some useful information too and, usually, a pretty good price. Our CF9 DeMarini Fastpitch review page might serve you well or, at a minimum, see what another $150 will get you. Also check our best fastpitch bat write up.